Here it is, my finished Levenwick. It should have been a really fast knit, but as I was unhappy with the fit, and had various issues with the sleeves, and the edgings, I kept putting it aside and working on other things. I blocked it on the weekend, and this morning got up really early, sewed the buttons on and then wore it to work. Emma took these photos on campus taking advantage of a beautiful fall day and a rusty wall. If I were to start over and knit it again, I would do many things differently. I knit it with about an inch of negative ease, but I think it would benefit from even more. I can see from looking at others on Ravelry, that it often looks too roomy – it really needs the negative ease to look right. On the other hand, the sleeves as written were too tight, so I added some ease to the sleeves. The biggest problem is that the raglan sleeves are too deep; I really wish I had separated off the sleeves an inch or two before I did. It throws off the fit of the entire sweater. I also wish that I had used a smaller needle on the lace portions (I used a US8 for the body of the sweater and a US7 for the lace edgings; I should have used a 6 to give it a bit more structure.) Also, the neck is too wide – I would make the neck shorter, and also have fewer stitches along the top front, to avoid the buckling around the neck. In case you think this sound really negative, there are things I like as well. I love the way the Cascade 220 knits up, and especially the way it blocked, which magically eased away many potential problems. I like the way you can button it up, or leave it half unbuttoned and get two different looks. I think the reverse stockinette stitch works well with the shape and the lace edgings. The asymmetry is good. 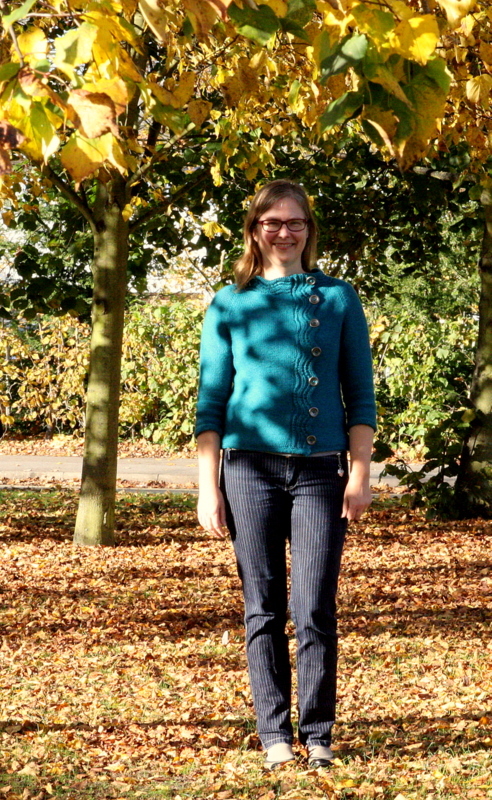 Plus, although I’ve worn jeans in these photos, I think it will work well with a skirt or a pair of nice trousers. 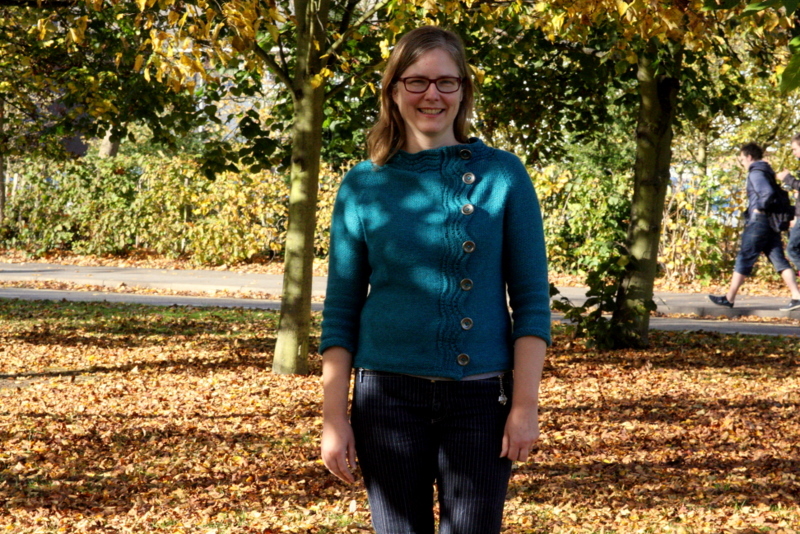 This entry was posted in Finished Project, Main and tagged Knitting, Levenwick by knitigatingcircumstances. Bookmark the permalink.